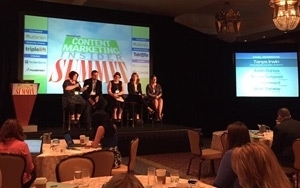 PHOENIX -- Expedia Media Solutions Director Jason Rubenstein’s presentation at the MediaPost Content Marketing Insider Summit on Friday moved many in the audience to tears. That’s okay, it was by design. Rubenstein showed several long-form videos, including a story of a friendship formed in the oncology unit of a hospital. Maggie, the survivor of the pair, went on to speak at a St. Jude event about how the organization helped her young friend. “The ‘Find Yours’ campaign has really helped to change the conversation, not just between us and our customers, but between us and our suppliers.” said Rubenstein. The multiplatform campaign focuses on the emotional experiences people can find when traveling. Through this approach, Expedia was able to become more than just a booking engine. In another presentation at the conference, Columbia Sportswear’s Scott Trepanier gave a behind the scenes look at how the company targets, distributes and optimizes their branded content at scale for maximum reach and consumer engagement. The company’s headquarters is located in Portand, Oregon (home of the naked bike ride) which is quirky and has influenced the brand’s marketing approach, says Trepanier, senior manager of PR, promotions and social media. To provide real ROI, content marketing needs to be scalable. New technology is helping brands to deliver on the dream of "right content, right person, right time, right place." The company created 80 “how-to” videos in 30 days and used longtail distribution (YouTube SEO). The final day of the event included presentations from executives who riveted the audience with insider tales from Taco Bell, Whirlpool and Nissan. The former digital marketing and social media lead was instrumental in initiatives including unfollowing all of the Taco Bell Twitter followers except for a few dozen who were truly brand ambassadors. Although the brand initially lost about 10% of followers, it quickly prompted many more Twitter followers than what they initially lost. He also initiated the stunt in which all of the brand’s social media sites went dark, and when they were “turned back on” they prompted followers to download the brand’s new app, with the hashtag #onlyintheapp. The promotion resulted in over a million downloads of the app in its first month. Jon Hall, senior brand manager at Whirlpool, prompted a reprise of eye dabbing at the conference after showing a touching long-form video the brand did with the “Every day, care” theme. The Whirlpool “Every Day, Care” Project: Perceptions of Care video shows how the members of the “sandwich” generation are caring for both their kids and parents at the same time and how they appreciate it but don’t always voice it. Before Whirlpool, Hall served in the armed forces in Iraq. There was a poor relationship between the coalition forces and local populace. Hall saw it as a marketing opportunity and he created an effort that helped improve the coalition’s brand image via face-to-face efforts, a radio show, a bi-monthly newspaper, billboards and other efforts. The effort was eventually rolled out to the entire country. Finally, Jeannie Whited, senior manager-executive communications & Media Center operations at Nissan Motor Co., told Content Marketing Insider Summit attendees the behind-the-scenes story of the making of the “truckumentary” to help launch Nissan’s new Titan truck this fall. The 15-part documentary season is currently up to part five, which focuses on cold weather and durability. She said initial results are promising both in terms of Nissan’s internal buzz, as well viewing metrics.